We'd love to hear about your great experience! Your reviews are important, we appreciate you taking the time to spread the word about our pratice. Below is helpful instructions on how to write a review on a few popular search engines. To leave us a review on Google, follow the simple instructions below and feel free to contact us with any questions you may have about the process. We appreciate your time! 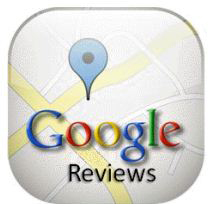 Go to Google.com and type in our business name and location you want to leave a review for example: "Hicks and McMurphy Orthodontics Mobile, AL"
Go to the link under our website description: "Write a review"
If you are logged in to your Google account: A window will pop up so you're able to leave your review. Once you've completed your review, hit "Publish" and you're done! If you are not logged in to your Google account: Google will prompt you to log in to your Google (or Gmail) account. Once you've completed your review, hit "Publish" and you're done! 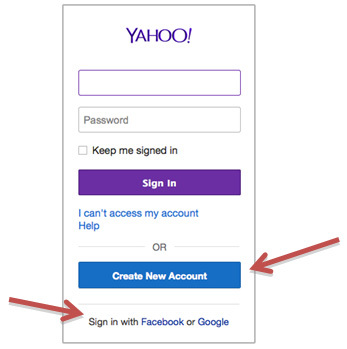 Once you click the link: Sign in to your Google Account or if you are not a member, click "Add Account" and then "Create an Account" follow the simple instructions. You will then be asked to sign up for Google+ to write the review if you are not a member already. Sign up and skip through the "about and add friends" sections. Return to the Google+ Local business page and click "write a review" once more. You will then be prompted to write a review. Publish and you are done! If there are ever any comments or concerns with our staff or your treatment we do ask that you let us know directly before leaving your review so we can address your concern. To leave us a review on Yahoo! Local, follow the simple instructions below and feel free to contact us with any questions you may have about the process. We appreciate your time! Step 5 Once you see the pop-up form, select the number of stars you wish to give the company and type in your review. When finished, click “Post Review” and your review will show up immediately. 1. Go up to the sign in button in the top right corner and click. 2. Click “Create New Account.” Or, you may sign in with your Facebook or Google account if you prefer. To do so, sign in as prompted. 3. 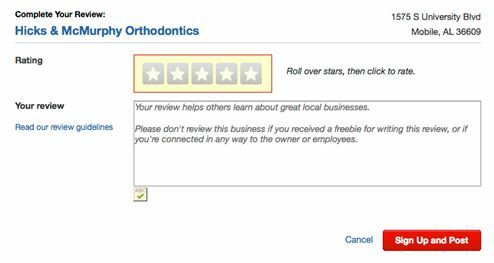 After you complete the form for a new account and hit “Create Account,” you will be able to write the review for “Hicks and McMurphy Orthodontics Mobile, AL.” Now you can go back to Step 5 above and follow the steps to complete your review! 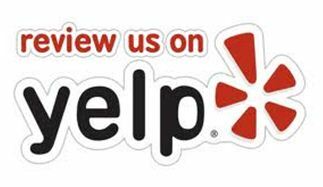 Go to Yelp.com and type and type in our business name and location you want to leave a review for example: "Hicks and McMurphy Orthodontics Mobile, AL"
A window will pop up, if you already have a Yelp review account, go ahead and click the "Log In" link at the bottom of the window. -If you don't have a Yelp review account, sign up with Yelp by logging in with your Facebook log ins or setting up a new review account. Once this is completed your review will be posted online shortly after. If there are ever any comments or issues with your treatment we do ask that you let us know directly so we can address your concern.